What could be better? 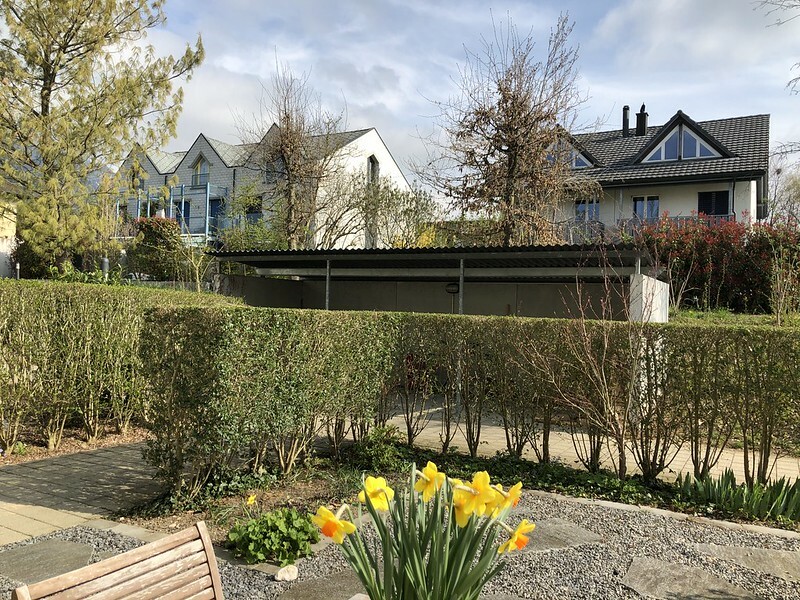 The sun is shining, I have finished with the morning chores and and am now relaxing on the computer until the next round – cooking lunch. The windows have been cleaned and my cleaning angel is busy doing the rest. There are days when life can be good. Yesterday I had a small drama, although it was really my fault for not paying better attention. For some time I have been meaning to have my eyes tested for new eye glasses. One of the lens was loose and yesterday it dropped out and the screw disappeared. I found an old pair of glasses through which I could still somehow focus, got ready and drove off to the opticians. He fixed it in a couple of minutes and now I have an appointment for an eye test and examination on Friday, meaning new eye glasses and I am so glad. At last my red darwin tulip opened up for me yesterday. It is just a matter of choosing the right time. When the sun is shining and until the end of the afternoon it obliges, otherwise it closes again. This time I took the photo with my mobile phone. Taking it with the Nikon is OK, but I get too much wrong focus and the background is not so clear. I also made an interesting discovery. 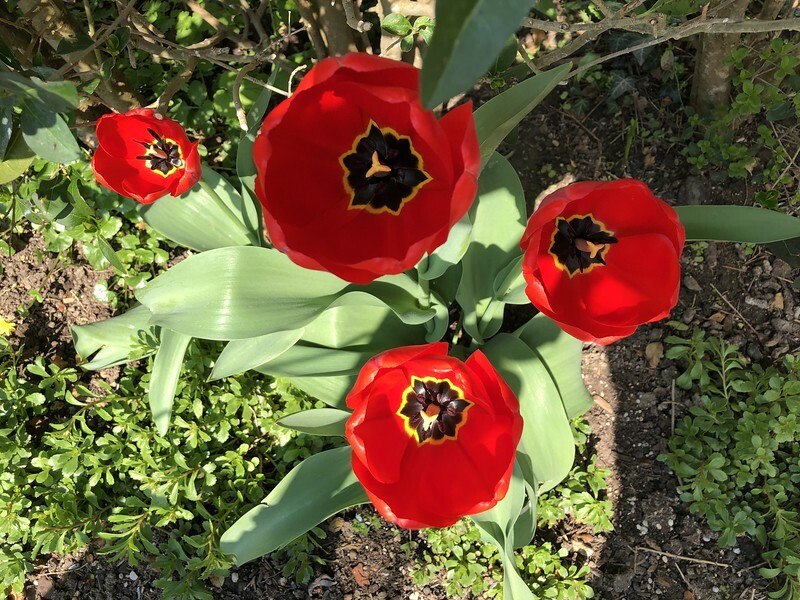 I found a second tulip growing in the same row as the other one, also a red one. This was also covered by the bottom of the hedge. 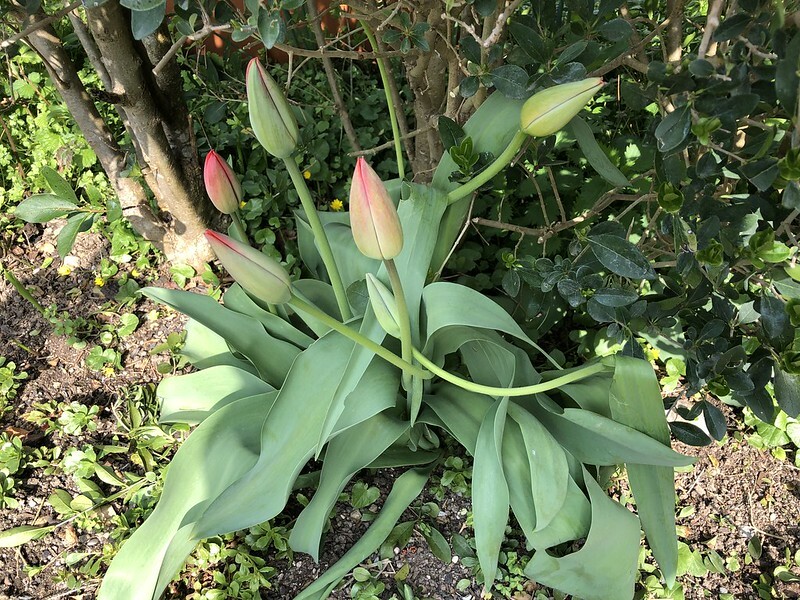 I have now cut away the hedge to give it more space to open and so it looks like there will be a second tulip opening ceremony at the week-end. As I was busy cutting the hedge the paparazzi were busy taking photos. 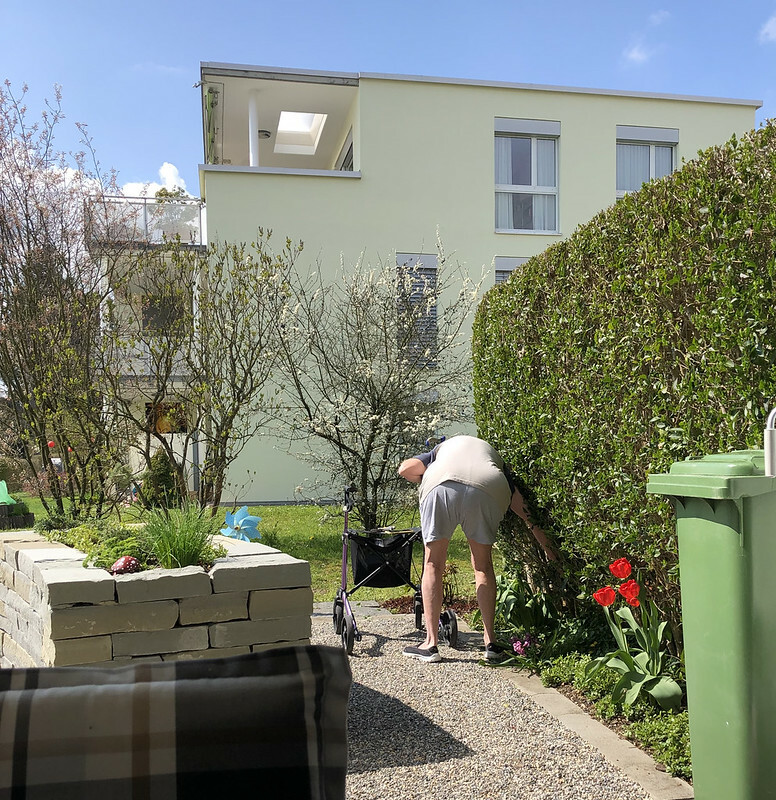 Not exactly a view from my best angle, but it is even possible to work in the garden when you have a walker to lean on. As you can see it is now shorts weather in my area, although I am not really so sure that it is the ideal dress code for a 72 year old golden oldie, but I only wear them at home. 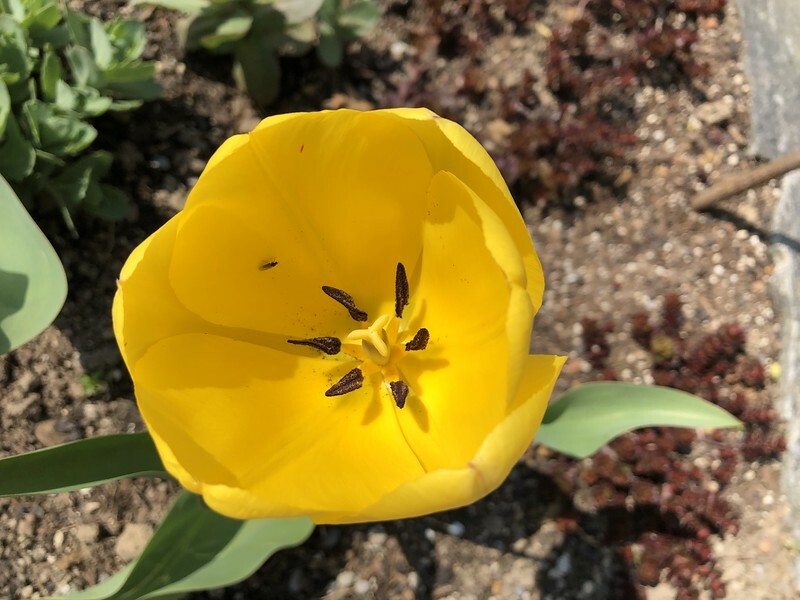 Further to my tulip show, I also have some yellow Darwin tulips that I planted many years ago and still appear every year. And that is enough of the Angloswiss tulip exhibition for today. This afternoon I am off shopping again, so I should really get around to making a list. Mr. Swiss has already noted a few items, and I will now be planning the meals. I oftem go to little parks by the side of a hwy. and njust write about the feelings I get by being there. I also haunt graveyards . It feels like the people th ere want to be heard and God is so near. I am a graveyard tourist and have visited many in Europe and taken photos. The gravestones say so much about who they were, how people perceived them, and how long they lived. I have a graveyard poem in the Boulder Jewish News called Rails. Sometimes the aur in graveyards feels so heavy. I often wonder if it is filled with souls. Ugh! I am having problems with post Loading so I cannot like them. But I like this! Your green thumb is something else. I do love tulips and those red ones, especially, are beautiful. Have a good one, Pat. I was so pleased today to discover a second tulip. I had to give it some space in the hedge but now it is really looking good. Tulips do multiply! Irises tend to go white when they multiply, so you are very lucky the tulips are keeping their color. Oh the daffodils and tulips! Such a great time of year. I have never enjoyed them so much as this year. Discovering a second tulip today was wonderful. Wish you many wonderful days . 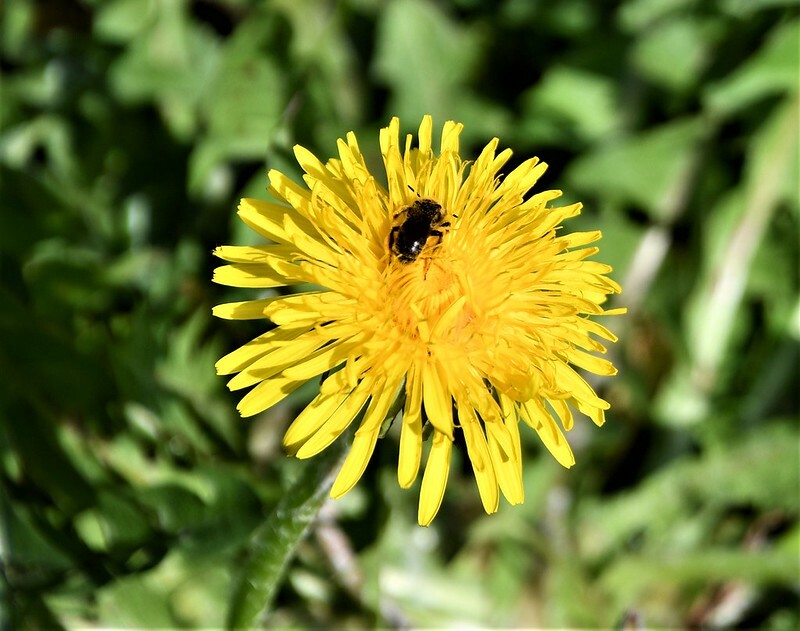 It’s amazing how far along you are into spring and we are so far short of it! It will be another month before our world begins to look like yours! Those tulips look like two of the most traditional of the relatively ‘modern’ Darwin types; ‘Red Apeldoorn’ and ‘Golden Apeldoorn’. Both have been around for a while, so ‘Golden Apeldoorn’ could be considered to be a ‘Golden Oldie’. That is impressive. I do not grow them. As I mentioned earlier, they do not get enough chill here to bloom annually. All your tulips are very pretty. Ours have not opened yet, or maybe they are not going to this year? Dunno. Nice post and it is nice to see that there is lots of colors 🙂 Here in Finland is still pretty cold and gray. We now have Spring. I have been to Finland, but it was summer when the days were longer and warmer. Great post! Have a wonderful day!